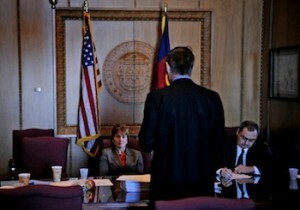 Never maybe in the history of Colorado has a staffer…a staffer…played such an outsized factor in determining the outcome of a major issue in the way Roxanne White, Governor Hickenlooper’s Chief of Staff, apparently drove the outcome of the half-assed commutation of Nathan Dunlap. Now Roxanne White gets to eat cake. Listen to this heartbreaking interview with Dennis O’Connor, the father of Colleen O’Connor, with Michael Brown on 630KHOW yesterday, where he describes his interactions with the governor and the role Roxanne White played in helping save mass murderer Nathan Dunlap’s life. You can listen to the full interview here. Truly heartbreaking. As we reported prior to the Dunlap decision, Roxanne White was threatening to resign if Hickenlooper didn’t save Dunlap’s life. It’s a sad day in Colorado when the governor takes his lead from his staffer, rather than the victims’ families. Pingback: Colorado Peak Politics - COLORADO’S PAULA BROADWELL: Hick’s New Comms Staffer Gets Paid $130,000 For What? Let's hope with this and the stupid gun laws he signed has shot himself (no pun intended) in the foot and loses miserably in the next election. This was painful to listen to…Hickie isn't such the "nice guy" that got him elected…he's just a tool. Let her resign! It is a disgrace of the comments/decisions of our political leader! What is this world coming to?